These lathe chuck shields provide a safeguard between you and the chuck, protecting your eyes (and shop) from rotating hazards like flying chips, sparks, coolant, and lubricant. The cover also moves out of the way for cleaning with the easy grip handle and hinge. Fits our 16" metal lathes. Drill and tap mounting holes for your application. It is mounted successfully on my 16 x 40 Nardini lathe. I managed to mount it without having to drill into the headstock casting. 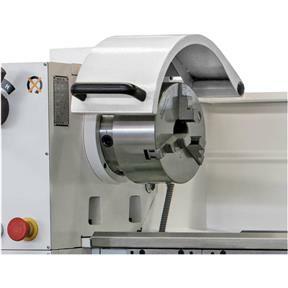 I purchased this for my new Grizzly G0509G lathe. It fits perfectly. The casting that supports the hinge pin wasn't machined flat, so I did a skim cut to correctly the problem. Also, the casting and hinge pin were designed for a Mico-switch to be used as an interlock when the cover is open. It would be nice if Grizzly also provided the switch and schematic so an interlock can be installed with the cover is open.